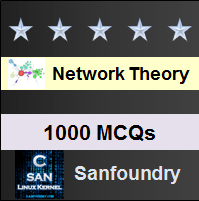 This set of Network Theory Multiple Choice Questions & Answers (MCQs) focuses on “Transmission(ABCD) Parameters”. 1.In the circuit shown below, find the transmission parameter A. Explanation: Open circuiting b-b‘, V1 = 6 I1, V2 = 5I1. On solving V1/V2 = 6/5. On substituting we get A = V1/V2=6/5. 2. In the circuit shown above, find the transmission parameter C.
Explanation: C = I1/V2 |I2=0. By open circuiting b-b‘ we get V2 = 5 I1 =>I1/V2 = 1/5. On substituting we get C = I1/V2=1/5 Ω. 3. In the circuit shown above, find the transmission parameter B. Explanation: The transmission parameter B is given by B = -V1/I2 |V2=0. Short circuiting b-b‘, -I2= 5/17 V1 => -V1/I2 = 17/5. On substituting we get B=17/5 Ω. 4. In the circuit shown above, find the transmission parameter D.
Explanation: D is a transmission parameter and is given by D = -I1/I2 |V2=0. Short circuiting b-b‘, I1= 7/17 V1 and-I2= 5/17 V1. So we get I1/I2 = 7/5. So D=7/5. 5. The hybrid parameter h11 is called? Explanation: h11=V1/I1 |V2=0. So the hybrid parameter h11 is called short circuit input impedance. 6. The hybrid parameter h21 is called? Explanation: h21=I2/I1 |V2=0. So the hybrid parameter h21 is called short circuit forward current gain. 7. In the circuit shown below, find the h-parameter h11. Explanation: h11=V1/I1 |V2=0. So short circuiting b-b‘, V1 = I1((2||2)+1) = 2I1 => V1/I1= 2. On substituting we get h11 = V1/I1= 2Ω. 8. In the circuit shown in question 7, find the h-parameter h21. Explanation: Short circuiting b-b‘, h21 = I2/I1 when V2=0 and -I2= I1/2 => I2/I1 = -1/2. So h21 = -1/2. 9. In the circuit shown in question 7, find the h-parameter h12. Iy=I2/2 and V2=Ix×4 and Ix=I2/2. On solving and substituting, we get h12 =V1/V2=1/2. 10. In the circuit shown in question 7, find the h-parameter h22. Explanation: Open circuiting a-a‘ we get V1=Iy×2 and Iy=I2/2 and V2=Ix×4 and Ix=I2/2. On solving and substituting, we get h22 =I2/V2=1/2 Ω.